Hemel Town missed the chance to climb into the National League South playoff places as they were held to a 0-0 draw by Wealdstone this evening. The Tudors had a goal controversially disallowed in the second half, and created a number of good openings, but they just could not find a way to break the deadlock. The point moves Hemel above Maidenhead United on goal difference, however they remain one place below Dartford, who cling on to the fifth by virtue of a one-goal advantage over the Tudors. Hemel went into the game missing centre-backs Reiss Greenidge and Adam Bailey-Dennis as a result of the injuries sustained against Gosport at the weekend, however the Tudors knew that a place in the top five was the reward if they could return home with all three points. After a quiet opening 15 minutes, the first half chance of the game fell to Hemel midfielder Oliver Thorne, but his shot flashed wide of the far post, before Ibra Sekajja blasted the ball over the bar when well placed soon afterwards. 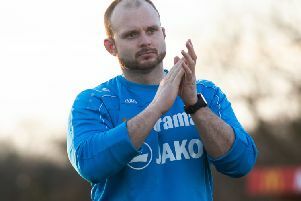 Wealdstone’s first real opportunity of the game arrived in the 35th minute when Nathan Mvila surged down the left and delivered a fine cross for Joshua McLeod-Urquhart who forced a fine reflex save from Tudors keeper Jamie Butler. Hemel finished the half strongly and could have gone in front in the 45th minute when Graeme Montgomery sprung the offside trap and forced a decent stop from Stones keeper Jonathan North at his near post, before a Matt Spring strike was deflected just wide. The visitors came close again at the start of the second half when Morgan Ferrier beat North to the ball and teed-up Sekajja, but his goalbound shot was blocked on the line by ex-Tudor Jack Smith. At the other end, James Demetriou should have done better with a half-volley from close range as his effort sailed over the bar with 54 minutes on the clock. Hemel thought they had broken the deadlock in the 70th minute when Jack Kelly headed home from a Ben Herd corner, but the referee deemed that an infringement had taken place and ruled the goal out – much to the frustration of the travelling Tudors fans and management team. There were a couple of late chances for both sides, with Ricky Wellard flicking a header just over the bar for the Tudors and Ferrier forcing a decent save from North in the last minute, but the game ended goalless. Wealdstone: 1 Jonathan North, 2 Joshua McLeod-Urquhart, 3 Jack Smith, 4 Wes Parker (c), 5 Tom Hamblin, 6 Elliott Godfrey, 7 Jonathan Wright, 8 James Demetriou (15 Marvin Morgan, 89 mins), 9 Jefferson Louis (14 Shaun Lucien), 10 Scott Davies, 11 Nathan Mavila (16 Luca Losi, 90). Subs not used: 12 Thomas Cadmore , 17 Mpania Kalenga. Hemel Hempstead Town: 1 Jamie Butler, 2 Ben Herd, 3 Jack Kelly, 4 Mat Mitchel-king, 5 Kyle Connolly, 6 Matty Spring, 7 Ricky Wellard, 8 Oliver Thorne (14 James Simmonds, 60 mins), 9 Morgan Ferrier, 10 Ibra Sekajja (12 Harry Hickford, 67 mins), 11 Graeme Montgomery. Subs not used: 15 Colm Parrott, 16 Joe Fitzgerald, 17 Xavier Comas-Leon.